The kids won’t be able to contain themselves on the waterslide. Fiorella’s serves Italian family favorites – it even has gluten-free and vegetarian options! Enjoy a refreshing cocktail poolside while you work on your sun-kissed look. Condos feature kitchenettes or full kitchens – perfect for whipping up the basics. Brush up on your game at Shingle Creek Golf Club – just 1.9 miles away. Children will have a blast on the waterslide at the pool. Relax with a cocktail at the poolside bar. Las Palmeras by Hilton Grand Vacations is conveniently located on Universal Boulevard near the best shopping and theme parks in Orlando. After getting settled into your condo, get changed into swimsuits, grab goggles and pool toys and sunscreen-up before hitting the outdoor pool – don’t forget the water wings! Relax on a lounge chair with a cocktail from the pool bar (open seasonally) and catch up on the latest issue of Glamour. When it’s time for lunch, look no further than the on-site Italian restaurant, Fiorella’s. Pizza and pasta for all! Being on vacation is no excuse to skip your daily workout. The resort’s fitness center is open 24/7, so it’s ready when you are. How convenient is that? One- and two-bedroom condos sleep four to six guests. Kitchenettes come equipped with a microwave and two-burner stove. Take the little ones along to Publix – the full-size refrigerator won’t stock itself. And freezers are perfect for storing everything from DIGIORNO pizza to dessert: Fudgsicles for the kids and Ben & Jerry’s for the grown-ups. Deluxe one- and two-bedroom condos have full kitchens that include an oven in case you want to bake your famous double chocolate brownies. Don’t feel like cooking? Good news! The resort offers room service (a late-night menu is also available if you want a midnight snack). 55-inch TVs feature ESPN, CNN and HBO. Whether you want to watch the big game, catch up on the news or get your Game of Thrones on, you're covered. DVD players are perfect for family movie night. Bring favorite movies from home or browse the selection of DVDs available to rent at the resort. Grab candy, pop some popcorn and call everyone into the living room (last one on the couch is a rotten egg!). Now all you have to do is decide what to watch first – Finding Dory or Monsters University? 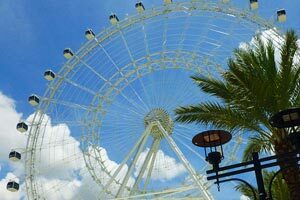 Universal Orlando® is just a short drive (or shuttle ride) from the resort. For the first time, muggles can experience the magical world of J.K. Rowling’s imagination: The Wizarding World of Harry Potter, located in both Universal Orlando® and Universal’s Islands of Adventure®. Enjoy a Butterbeer at the Leaky Cauldron. Hop on the Hogwarts Express (with a park-to-park ticket) to Hogsmeade and ride Flight of the Hippogriff and Harry Potter and the Forbidden Journey. Ready to experience a different kind of magic? Head to the four theme parks and two water parks of Walt Disney World®. Magic Kingdom® is home to Disney’s most classic attractions including New Fantasyland®. Have lunch in the Beast’s castle at Be Our Guest restaurant. Or experience food from eleven different countries at The World Showcase® at Epcot®. First Time in Forever: A Frozen Sing-Along Celebration can be found at Disney's Hollywood Studios®. Visit Pandora - The World of Avatar® (new as of May 2017) in Disney’s Animal Kingdom®. They are all less than fifteen miles from Las Palmeras.